The H-900 is designed for horizontal or vertical flow with a large flow area (not suitable for down-flow applications). The angled seat reduces disk travel from full closed to full open. The valve is equipped with a shaft pivot located slightly above centerline; pressure on disk area above pivot partiality balances pressure on area below pivot to reduce slamming. 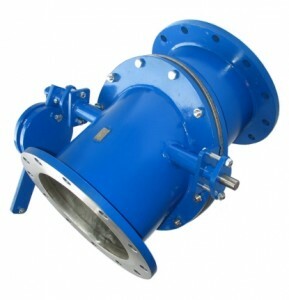 The valve is available with external counterweight and dampener. The H-900 can be fabricated from any weldable alloy and is clearly marked to show direction of flow. 3″ to 24″ is standard, but larger sizes are available.